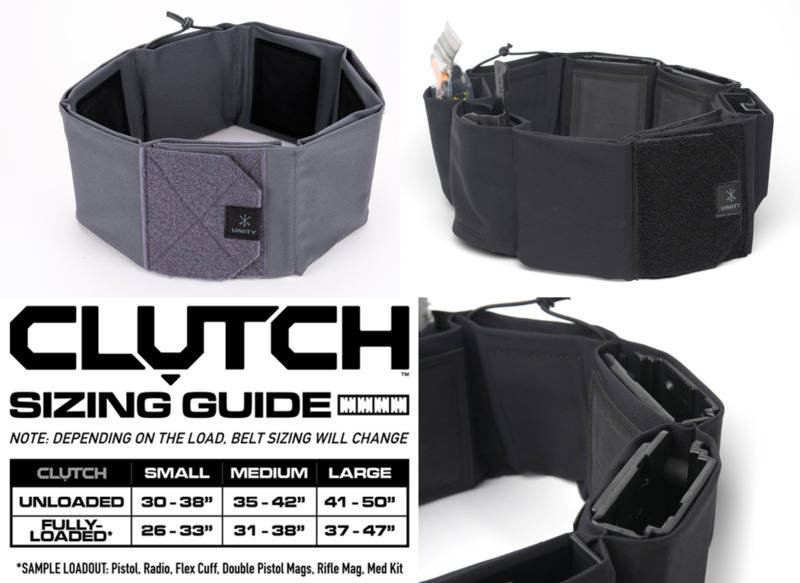 The Unity Tactical CLUTCH belt is a modular multi-purpose belt designed to work for a wide range of missions. It can be used covertly in non-permissive environments under civilian clothes to conceal and secure a wide variety of gear. The belt may also be used overtly as a battle belt, training belt, active shooter response kit, or just about any other capacity. 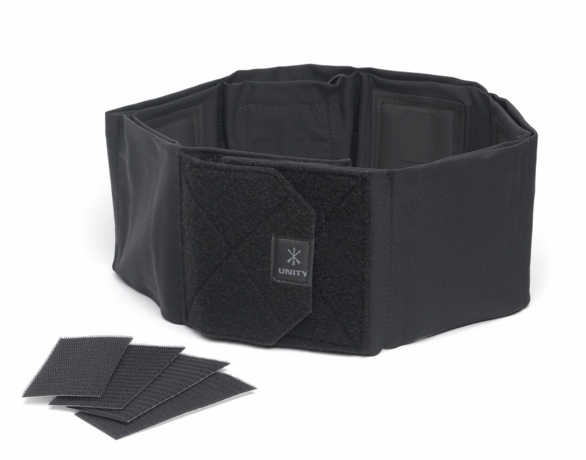 It is constructed of a durable two-way stretch fabric to allow it to fit comfortably over a wide range of clothes or IWB gear while holding its contents close to your body. Each cell contains padding for long-term comfort, internal Velcro to retain inserts securely, and is backed with textured Slip-Not material to keep it in place. Slots in the Slip-Not material allow for the use of belt keepers if desired for an extra secure hold. The belt is highly-configurable for any mission requirement. INCLUDES: Belt, velcro strips, and alcohol wipes to adapt existing gear to the CLUTCH system. Carriage Options: Handgun, Hand/Flex Cuffs, Credentials, Knife, Baton, Pistol Mags, Rifle Mags, Flash Light, Multi Tool, Radio and more. Any pictured pouches and accessories are sold separately. Suggested Uses: Undercover/Non Permissive Environment Use, Active Shooter Response Kit, Low Profile, Range/Bugout, Battle Belt (Non Load Bearing), SAR/Security, Everyday Carry (with the right cover garment). Inserts: You can easily adapt existing gear to the CLUTCH system. Works with most low-profile kydex and injection-molded holsters and mag carriers up to 4.5″ wide, simply remove any existing mounting hardware and apply the included high-strength velcro according to the included instructions. Also available from UNITY is the low-profile and highly adaptable CLUTCH Insert Kit (sold separately). Sizing: See small inset picture for sizing info. The more loaded up with kit, the tighter the fit of the belt. See link below for CLUTCH Belt Insert Kit.